So I am trying a new trend. I like to read (and yes, listen... I lurve me some audiobooks. I find it recovers a lot of "lost" time and allows a certain level of safety. It pretty much is the main reason I don't mind running (and anything that makes exercise more enjoyable is a good thing)). And I think that there is value in writing about what I have read. So my goal now is to do at least a mini-book report on the latest item on the pile. 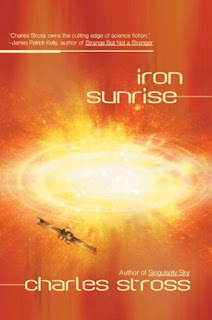 Iron Sunrise is the latest on my read list. Charles Stross is a relatively recent find for me, but after reading his truly awesome Laundry series I made it a point to go back and explore some of his other works. Iron Sunrise is actually a sequel (though the author has said that there will be no more books in this universe) to Singularity Sky. It brings back the two main characters from that story, Rachel and her now husband, and introduces a who new spread of characters (slowly weaving the seemingly unrelated plots together). The world of these novels is quite interesting, as it is affected by the post-Singularity intelligence Eschaton, which upon reaching consciousness immediately flung 90% of the Earths inhabitants onto planets up to thousands of light years (and correspondingly that far back in time). Humans being humans, we don't quite get along with each other, and the story begins with the planet of Moscow dying due to the sun exploding, and the retaliatory fleet (which can take decades to arrive) is launched at their competitor New Dresden. Of course the story isn't simply the mission to hunt down the Moscow Ambassadors who can recall the retaliation fleet, in a race against time as the Ambassadors are slowly being murdered, because as you would expect that is just the first layer of a multi-level plot that will keep you entertained through out the book. Overall this is a great book. Enhanced if you read Singularity Sky but with enough exposition to allow you to jump in if you have not.